My thanks to all my friends loopers. With each of them I learned something so precious that allowed me to evolve as a musician and create and publish these songs. 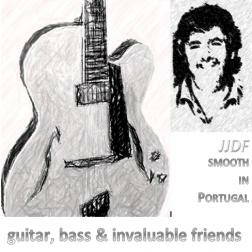 A special tenderness for João and his musical univers. I always have a lot of pleasure to join in its ideas. Thank you my friend for your freshness ! What a nice and fresh album! Wow. I discovered this only today, more than two years since João (and others) created this beautiful album. And what could I say? I love every note I hear - so thanks and congratulations my friend, I hope to hear many more tracks from you! What a great pleasure to listen this album my friend. For me it is always a pleasure to hear this kind of music . Because of you , it is easier to understand this music . Thank you for that! I always enjoy listening to JJ's lovely arrangements and play. And his mastery of chord. I am honored to be included here.